Meredith Village Savings Bank Fund Committee Members announce 2018 grants. Left to right: Michael O’Leary, Justin Van Etten, Jeanie Forrester, Rick Wyman, John Kitchen and Charley Hanson. The Meredith Village Savings Bank Fund at New Hampshire Charitable Foundation has awarded $120,381 to 32 non-profit organizations. These grants are additional to the Bank’s many local contributions in the form of sponsorships, donations, matching funds to the United Way and scholarships, as well as the exceptional volunteer efforts of its employees. Thirteen food pantries that serve the same communities as Meredith Village Savings Bank will share a donation total of $19,500. Awarded $5,500 for the purchase of an electrical hardware and system update for its Vex robot. The updated system includes the computer, controller, motors, batteries and sensors—materials essential to the team’s ability to compete. Belmont High School’s Robotics team provides opportunities for students to learn and attain STEM-based skills, gaining the confidence and knowledge needed to pursue careers in related fields. Awarded $4,500 for the purchase of camping and outdoor equipment. The Earth Ecological and Environmental Stewardship Club encourages an appreciation for the outdoors among student participants, leading to the mindset of protecting and conserving wild lands. Awarded $4,543 for the purchase of a tractor sickle bar mower for extensive clean-up and maintenance of the Cotton Valley Trail. A year-round, recreational, multi-use rail trail that completed in September 2017, the Cotton Valley Trail extends 12 miles, linking together the towns of Wolfeboro, Brookfield and Wakefield. Awarded $3,750 to support Meals 4 Kids, which provides ten meals per week per participating child throughout the summer and during school vacations. Committed to ending hunger throughout the Seacoast region, GATHER partners with the community to address the root causes of hunger. The organization offers nutritious food from its innovative distribution programs, as well as through its pantry market. Awarded $2,000 for the purchase of books and other literacy materials to children in need throughout Laconia. Got Literacy! supports summer reading engagement to student beneficiaries of the Got Lunch! Laconia program. Awarded $5,000 to help fund its outreach to Lakes Region area children who would benefit from equine assisted therapies such as adaptive riding and hippo-therapy. The Granite State Adaptive was founded to provide individuals who have a disability the opportunity to develop independence, confidence, life skills and fitness through participation in sports, therapy, training and recreation programs. Awarded $15,000 to support associated costs, including furniture and supplies, for veterans moving into the Boulder Point Veterans Housing Facility in Plymouth. Construction for that facility completes in spring 2019. Boulder Point will provide permanent housing to the area’s most vulnerable, low-income, disabled and homeless veterans. Harbor Homes is based in Nashua, NH and serves low-income individuals and families who are homeless, at risk of homelessness, or living with mental illness and other disabilities. Awarded $8,708 for the purchase of a gazebo for the hospital’s Adult Day program, allowing participants access to the outdoors. The Adult Day program provides care for members of the community who are unable to spend the day alone safely, so that their caregivers have the opportunity to work, attend medical appointments, run errands or spend time away from the pressures of caregiving. With a focus on compassion, concern and quality of care, Huggins Hospital serves patients regardless of their ability to pay. Awarded $5,000 toward the renovation of newly purchased property in Concord. The new space houses supportive programs for families raising children with serious emotional disturbances, accommodating suicide prevention initiatives and early intervention services for children. The National Alliance on Mental Illness (NAMI-NH) is committed to improving the lives of all people affected by mental illness and suicide through support, education and advocacy. Awarded $5,000 to expand initiatives through rural community outreach and housing for victims of violence. New Beginnings is dedicated to ending domestic, sexual and stalking violence through the provision of safe and effective services, including emergency refuge and support. The organization works toward social change by promoting an effective community response to violence. Advocates provide crisis intervention services, shelter and support to victims of domestic and sexual violence and stalking. Awarded $4,000 to create a series of trainings for substance use professionals statewide in regards to military culture as it relates to substance misuse. The NH Alcohol and Drug Abuse Counselors Association is dedicated to advancing addiction professionals in NH. Through education and advocacy, the organization strives to enhance the knowledge and skills of addiction professionals, increase awareness of addiction issues statewide and promote programs and policies that help those struggling with addiction gain access to high quality services. Awarded $4,000 to sponsor a Camp Resilience session in 2019. Camp Resilience provides a sustained comprehensive curriculum to help wounded veterans recover their well-being by engaging in sports, adventure activities and life-skill programs. Awarded $5,000 to support trail, bridge and boardwalk improvements located along the Kent Ecological Trail at the Quincy Bog Natural area. Improvements will result in greater public access and enhanced on-site learning opportunities. Rumney Ecological Services connects people with nature and conserves more than 800 acres in the Pemi-Baker watershed. The organization monitors plant and animal communities on its lands, hosting walks, talks and workshops with nature experts. Awarded $7,500 for the repair of the Club’s groomer tracks. The Sno-Streakers Snowmobile Club is Meredith’s snowmobile club that relies solely on local support and volunteers to keep trails maintained, groomed and safe. Awarded $5,000 to help hire monitors during the weekends between Memorial Day and Columbus Day at Mount Major. Monitors will greatly assist the Society’s efforts to maintain clean, safe and enjoyable trails for visitors of Mount Major. The Society of the Protection of NH Forests is dedicated to protecting the state’s most important landscapes, and to promoting the careful use of its renewable natural resources. Awarded $4,500 for the purchase of an Ankle Brachial Index (ABI) System for the Hospital’s Wound Care and Hyperbaric Medicine Center. The ABI System detects and diagnoses Peripheral Arterial Disease and other circulation issues for patients seeking wound care. The second largest employer in Plymouth, Speare Memorial Hospital is a 25-bed, critical access hospital that provides the greater Plymouth community with emergency medical care, in-patient care as well as primary and specialty health services. Awarded $3,880 for the repair and restoration of the theater’s front doors. The Village Players is a non-profit amateur community theater in Wolfeboro. Awarded $3,000 to support scholarship programs for the 2019 Aerospace Career Education (ACE) Academies conducted at Laconia Municipal Airport. The ACE Academies include field trips and aerospace education programs for students in high school, middle school and elementary school. WinnAero was founded to promote youth interest in STEM through aviation and aerospace educational programs and experiences. WinnAero also aims to foster enthusiasm for flight, aeronautics and aerospace for people of all ages. Awarded $5,000 to invest in two perinatal fetal monitors, a base station, installation and staff training. The only all-female Women’s Health practice in Northern NH and Western Maine, Women’s Health at Memorial Hospital provides healthcare for every stage of a woman’s life. The Meredith Village Savings Bank Fund was established in 1997 under the leadership of John Starrett, then President and CEO of the Bank. 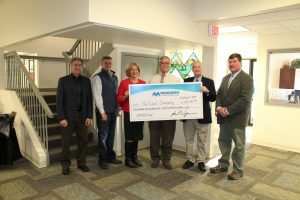 Since then, 383 grants totaling $1,531,248 have been awarded to a wide range of environmental, social, educational and historic projects throughout the Greater Lakes Region, Plymouth and NH Seacoast areas. Over the years, the Fund has supported literacy programs, after-school programs, environmental monitoring and education, restoration of historic structures, organizations that provide support for individuals and families in challenging circumstances and equipment that helps save lives. The deadline for consideration for the next grant cycle is October 15, 2019. Applications are available on mvsb.com.